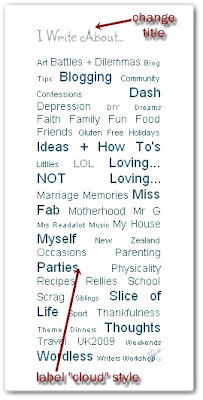 "Labels" as they are called in blogger, are more important than you may realise. Choosing and using labels well helps you categorise your posts, making it easier for readers to find posts on a topic they are looking for, and for you to find old posts also. They end up with hundreds of labels, some with only one or two posts under them. Of course there's nothing wrong with that. But it can be really helpful to limit your labels and use your label widget as a sort of table of contents. 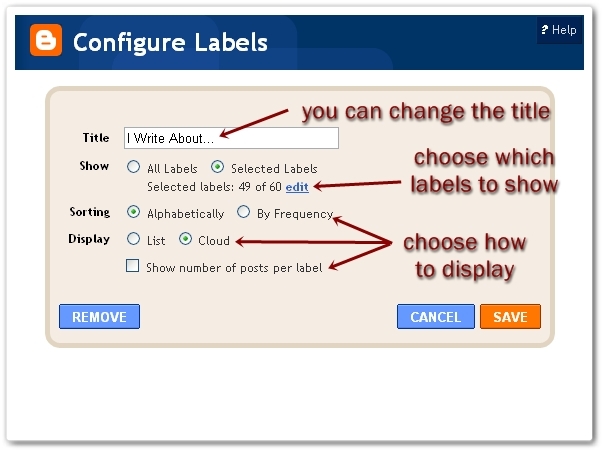 You can choose which labels to display, whether to display in alphabetical order (or not) whether to show the number of posts, whether to display as a "cloud" or a list. 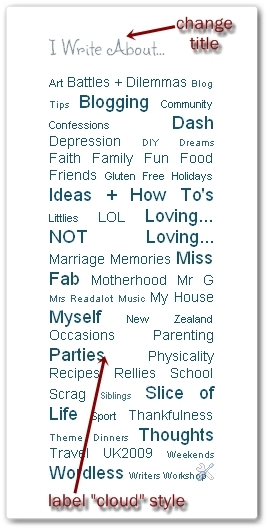 If you have never realised the purpose of labels in this way, it is easy to go back and change, add or remove the labels you have on your posts in the "Posts" menu. Great post! I need to do a little work on mine. I didn't understand what purpose they served for a long time, so there are many with not many posts. But I don't have them displayed right now. Thanks for the info! Thanks so much for this post! I, like the others, didn't know I could change the labels! Today, I found your blog again, and I'm so glad!